Ah, the Manhattan—one of the most classic cocktails and one of Josh's and my favorites. I have so many great memories of this drink and its lovely, spicy balance of wood and sweet. It was actually one of the first cocktails that Josh and I learned to make. Cramped into the small dorm room in a college music frat, one of Josh's old buddies opened up his clothes closet to reveal an ad hoc shelf made out of two chairs and a few pieces of plywood, a delicate looking structure that held a sophisticated array of spirits that he had collected from online shopping—and, what's more, a home ice machine. We were enchanted. With old jazz bubbling out of his stereo system (college music majors—go figure), John twirled a mixing glass in one hand and a jigger in the other—and began to show us how to make a Manhattan. John—a slimly built college senior who was fond of sweaters, cigars, rocking chairs, and classical music—was also a surprising, self-taught bartender. He had scoured all the books available at the time and made careful notes in the recipes' margins, honing each through trial and error. Don Lee, who would later teach me all sorts of cocktail wonders, told me that learning to make cocktails in a vacuum was impossible. For ordinary folks like Josh and me, it certainly was. But John had somehow become a self-made man in his exploration of some of the classics. The bar renaissance might have very well have started in that tiny dorm room. The second memory that comes to mind is actually a work party in DC. On a cold day in February, a coworker and I decided to go in on a dozen oysters. We paired it with a strong Makers Mark Manhattan with more than its fair share of bitters. Somehow perfect. Enough of this sentimentalism schmentalism. On to recipes! The key to a good Manhattan, in Josh and my minds, is water content. A lot of people dump everything into a glass, add a couple of cubes, and give it a single stir (or worse, shake). When they pour it out, it tastes bitter and sour. When you stir the cocktail adequate and let it sit, the water pulls out all of the lovely characteristics of the whiskey. It becomes almost floral. The bitters become Christmas spice, instead of pepper spice, and the Vermouth becomes smooth. 2. Pour in all ingredients. 4. Let sit for a bit. 5. Add more ice, if room. Give it a last stir. 6. Strain into coupe glass with julep strainer. 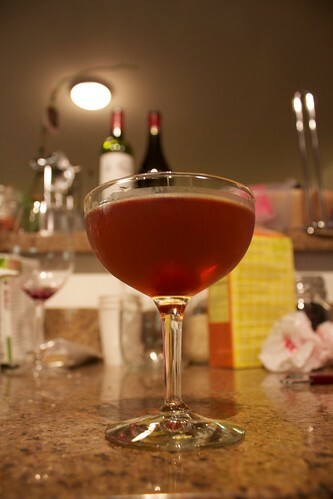 Josh and I are returning to this abandoned blog to post, among other San Francisco and home adventures, a series about what we consider our essential cocktails—tried-and-true favorite drinks that you can make at home with affordable ingredients. So when Josh asked for something refreshing this evening, I thought it would be a perfect opportunity to kick this thing off and turned right to the Aviation. The problem? Well, I started to tweak it. The modern classic version typically calls for four ingredients: gin, maraschino liquer, lemon, and creme de violette (a fragrant purple liquer that indeed tastes like the delicate flower). Though I had planned to follow the classic recipe, as I built the cocktail in the shaker, I started to recall my typical experience with Aviations—that is, they just taste too sour. 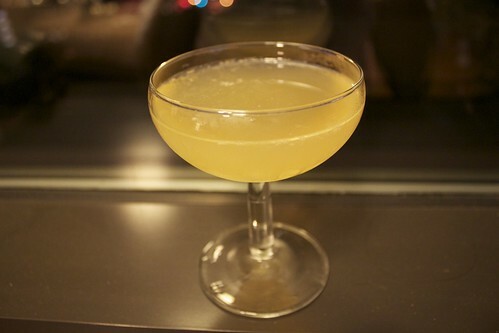 Shaken and poured up in a coup glass. I was actually pleasantly surprised that adding simple syrup compensated for the tartness I've tasted before, and the ango gave a nice balance—a particularly helpful complement to the Creme de Violette which can be too fragrant and overpowering. Has anyone else tweaked the Avaiation in a similar fashion?